182 entries categorized "Venture Capital & Private Equity"
Update 3 (2 feb 2011, 20h00 Paris time). Sorry about the late update, I was busy with something else in the past 24h. So looking again at the official press release on KITD's site, it says the price is "approximately US$26.7 million on a cash-free, debt-free basis, comprised of US$11.7 million in cash and the remainder in shares of KIT digital common stock". Looking at the SEC filing, it says "The consideration for all of Kewego’s outstanding stock was €25,655,022, subject to a customary post-closing adjustment for working capital and net cash. The purchase price consisted of €8,750,149 in cash and the issuance of 1,411,704 shares of KIT digital common stock." So here we have 2 different numbers. One is 25.6m€ to be adjusted for cash and debt, the other is net. Hence, unless I'm mistaken, the real price is indeed as I wrote earlier $26.7m=19.5m€ of which 8.75m€ to be paid in cash upfront. Analysis below confirmed. I've had a few discussions with industry insiders; what they say is that the investors sold all their shares (100%, not 49% only). That means that they couldn't really agree on price with Orange, and that the price range given by Martin Rogard below is indeed between 120-200m€ but subject to negotiation. Final price will therefore be indexed on some metrics to be adjusted in 2 years time. There must therefore be a document allowing payment for at least the remainder of the 51% at 120m€, maybe more. This information is not in the press release. Therefore the analysis below has to be adjusted slightly, meaning investors did not make 1x (getting their money back) but 2x on this deal (to be adjusted by costs incurred in running the deal, hence probably closer to a 1,5x range), potentially more in 2 years. I hear investors at the later stage did indeed make somewhere near to 1.5x. Good for them. They got their money back, but with a very small upside considered the "potential" of the company as a top 100-ish site in the world (alexa says 106). 3) on the purpose of this post. - this the way the industry works : depending on the fund, 1/3 of companies in a portfolio go bust, 1/3 make between 0.8-1.5x (basically get the money back - not a success), and 1/3 do nicely of which 1/10 does great. My point here is that both these 2 exits fall into the middle category, of just getting the money back to investors. - finally, some background quick maths are necessary to interpret press releases, so that we just don't all jump in joy saying the market is back; and of course, press releases definitively don't give all details regarding prices adjusted for cash, debt, liquid prefs and so on. So we only get a myopic view on the deals with the available info. At least I hope the analysis process was interesting to you all. Update 2 (1 feb 2011, 18h00 Paris time) : Olivier Heckmann (Kewego) just sent me a link to official numbers (SEC filing) on their acquisition by KITD. 25,6m€ (not 19,5m€ I found yesterday on the Press Release) - I'll update my blog post later today. I tried earlier to post a reply (in French) on Techcrunch France, but it hasn't appeared yet : I guess it must be moderated. I've copied it a the end of this post. In a nutshell, both these deals seem to me to be rather bad deals, that fall in the middle category of "in 2-3 deals out of 10, a VC gets just his money back". The other categories being of course : "6-7 deals fail", and "1 super hit". Let me first say that I don't have ANY inside information on these deals, and I'm just working on published numbers in the press. I have no access to captables, specific contracts (ie. liquid preferences and the like), and previous cash-out situations when existing shareholders may or not have gotten some money out. - the company has raised in several rounds about 46,75m euros. The press release said that the 58.8m€ purchase price for 49% was mainly to pay out existing shareholders. Quick maths tell me that if VCs (investors) had 79% of the shares (they might have more or less, depedning on how much founders and employees have), they are JUST recouping their money on this round. Upside will come with the call Orange has in the next 2 years to buy the remaining 51% at a potentially higher valuation. - had the investors put the money to work with bonds for example, the yield would have been 7,9%. Not bad, but not venture material. - the company has raised in 3 rounds, 14,7m€. The press release states a 19.5m€ purchase price (at today's USD/EUR exchange rate), of which 8,5m€ are to be paid in cash, the rest in stock. Again quick maths, is that if VCs owned only 75% (14,7/19.5), they are just getting their money back. Period. Actually, the cash paid (8.5m) in this deal is not even enough to pay back the money invested. It will have to come from the stock portion, where there is up to 2 years lock-up. Ans potentially some upside if KITD's stock goes up. - the cumulated tunover generated since inception for each company is only slightly larger than the money injected (last 3 years for Dailymotion: 18, 16, 10 - last 3 for Kewego : 7.5, 6.4, 5.4...), but definitively not in terms of EBIT. Since the enterprise value here is used to only pay back investors, the "industrial" asset (DM = a destination site with 1B VV/month, K = a software, 400 clients) is left with no assigned value (and that includes employees, brand, partnerships, contracts, etc.). Sad. Hopefully founders and employees would have gotten something from these deals, financially; otherwise their hard work would only have been compensated by their salaries. Un rapide calcul d'intérêts aux bonnes dates, donne environ un taux d'intérêt de 8.1% sur l'argent investi par les VCs, pas extraordinaire au regard des performances attendues pour une startup, mais comparable à un bon placement obligataire... à noter que l'argent décaissé à ce stade avant fin de lockup, ne couvre pas l'argent des VCs... Le cours de KITD en revanche a pris 3% déjà. qui proviennent à la fois des activités de logiciel vidéo hébergé pour le Web, et de l'activité écrans interactifs dans les entreprises (qui est ce qui semble intéresser KITD d'après son communiqué). Donc : bon multiples en termes de CA et EBIT, mais pas terrible en termes de ROE pour les VCs (14,7 de money/19,5 de EV = 75%; si les VCs n'ont *que* 75% de la boite, ils ne récupèrent que leur cash, à 0%). Il reste toujours l'upside si le cours de KITD augemente d'ici 2 ans. Un calcul similaire d'intérêts donne un placement à 7,9%, similaire à Kewego. Je n'ai pas trouvé dans le CP si le rachat de 49% des parts par Orange était cash ou stock. Idem, 46,75/58,8 = 79%. Si les VCs n'ont *que* 79,5% de Dailymotion (le reste auprès de fondateurs, collaborateurs), ils ne font que récupérer leur cash sur ce coup-ci. Mais ils ont probablement plus, je ne connais pas la captable. Et il reste l'upside des 51% restants, car il reste une option d'achat sur le reste des 51%, à une valorisation potentiellement supérieure. Disclaimer: I used to be in the online video provider industry from 2005 - early 2010, and left the industry about a year ago. Following the publication of this post, I had a quick twitter exchange with Martin Rogard, Managing Director France of Dailymotion. Since these were public tweets, I guess it's ok to reproduce them here. "Orange est entré en négociation exclusive avec Dailymotion en vue d’acquérir 49 % du capital du site de vidéo en ligne. A partir de 2013, le projet permet la montée au capital progressive jusqu’à 100% avec l’arrivée éventuelle de nouveaux partenaires industriels." Orange will own a 49% equity stake in Dailymotion for 58.8m€. (...) Orange entered exclusive negotiations to acquire 49% of the equity of this video site. Starting in 2013, the project allows the progressive acquisition of equity up to 100% with optionally new industrial partners". - duh ? it's not even signed ? Well regulators, employee councils, etc. have to approve it I suppose. Hopefully there are nice LOI, MoU, and more good legal stuff to back this deal. Normal sutff, hopefully noone will back out. - 58,8m/49% = 120m euros valuation for the company TODAY. - firstly, "allows" means Orange is under NO obligation to buy more equity. Unless there is an official statement from either side that existing Dailymotion shareholders have a right to sell the remaining 51% equity (= a put) at 120m€ valuation, meaning selling the rest of the equity for the remaining 61.2m€, I'll keep my analysis above. There might be some more equity sold, yes - agreed - the PR says so, but no certainty in it. I asked Martin whether Dailymotion shareholders had a put (right to sell) and Orange had a call (right to buy); he said both, but wouldn't go into details. That information has not been made public. - secondly, the PR does not give us any clue at what valuation the next round will be "starting in 2013". Martin Rogard (MR) in the tweets mentions that "worst case scenario is a 120m valuation". Well that is the valuation today at which price the 49% were sold. I have no information to say that the valuation will be the same in 2 years. That's why liquid preferences and rachet clauses, and the like exist. MR says furthermore "valuation will be between 120m and 200m euros, as stated by Orange". I don't have an official source for this. If MR says so, then so be it. If indeed Orange would buy more equity, and at a valuation higher than 58.8m€, then my analysis above would have to be modified, as it would equate a better return on investment for existing shareholders.
. sell the company, hence get 100% of capital-gain. Although the hint at some other industrial partners tells me that it doesn't really want to there.
. get a majority vote. with such as heavyweight shareholder, it is going to be hard to other shareholders to disagree fully. Hence not really.
. get more dividends from Dailymotion ? well with 18m euros in 2010, even with 100% growth each year, it's only a very small % for Orange's turnover and EBIT.
. get rid of the other shareholders : well they could have done so right now. Therefore, my guess is that Orange will stay at 49% (unless they have to buy more share by contract), or buy at a discounted valuation (unless the 120m€ minimum valuation is guaranteed by contract) some extra shares. Sometimes, the only way to analyze a deal is to have access to all documents ! Press releases are definitively not enough a source of information. - fourthly, Frederic (my former investor in my video company ;) makes a good point again (I had mentionned it above) about liquid preferences. Basically, when an investor buys equity, he gets shares that have more rights (preferred stock) than the existing stock (common stock). Subsequent investors can also have more rights than first investors (hecne different series of preferred stock). One of these rights is to be paid back before anyone else. Hence if 47,75m€ were in preferred stock, then if 58.8m€ are paid, then 47,75 are first paid to the preferred stock, before looking at what is done with the remaining cash (58.8-47.75 = 11.05m€), that can be split proportionally among all shareholders (including the investors with preferred stock), or just among hodlers of common stock. The problem arises when there is a preferred stock right with a MULTIPLE. (1.5x, 2x, sometimes more...). In this case, with a 1.5x multiple preferred stock, then 47,75x1.5 = 71,625m€ has to paid out to existing investors (in this case ALL of the 58.8) before common stock shareholders get anything. In this example, the VCs would get all the money paid by Orange, and founders and employees would get NOTHING. This is very common (I have no information on this case). That would change slightly the maths I did above in the analysis of return on equity for VCs. Same applies to the KITD / Kewego deal. If there were any liquid prefs in the deal, the maths do change a bit. Hence, any entrepreneur and decent VC will tell you that what matters when you negotiate a term sheet is not the valuation, but the valuation AND the investment contract (which holds such matters as liquid prefs or not...). Finally, a word on the buyers : if they buy a company, it's because it makes sense to them. Usually, when you acquire a company, you have made a business case about the value of synergies, acquisition, etc. of the target company. I have no insights into the industrial benefits of such acquisitions. As an example, looking at Dailymotion's audience and rate card, I can assume they do about 1b video views/month x 12 = ~25 billion video views / year = ~25 million CPM / year (it's an average approximation of all their ad units, assuming video ads represent well the business). With revenues of 18m€ last year, an average CPM was sold at : 18/25 = 0,72€. Assuming traffic stays the same, and that Orange can monetize 49% of all traffic, they get 12,5m CPMs per year. Assuming they amortize their acquisition over 2 years, that's 25m CPMs over 2 years. If they paid 58.8m€ for them (excluding an "R&D" cost for the technology), then that's 2,35€/CPM. That's 3,3x what DM currently gets in revenue per CPM. But maybe more marquis customers, wider exposure to 30 countries, etc. can bring that extra revenue per CPM. Or Orange could amortize the acquisition over more years. Or help grow the traffic more. Assuming 10% (I read that stat a long while ago somewhere for DM) of inventory is sold, then Dailymotion would have to sell its inventory at a minimum of 2,35/10% = 23,5€/CPM. That's less than the prices on the rate card :) Anything above that would bring in a margin for Orange (since there is not need work additional working capital, the company being profitable). And there's room for growth for Dailymotion vs Youtube that is about 60x bigger (2 billion video views/day vs. DM's 1 billion video view/month). Maybe achieved with a better product, better distribution, better focus, cheaper advertising, better targeting, etc. Anyways, good luck to the folks in Kewego and Dailymotion. Interesting times ahead. At my BizDev class at INSEAD this week I got the option of whether one would raise money from VCs or not. 1) if your business requires financing for CAPEX or workinc capital, and you don't have the financial solidity to back it on your own, either reconsider your business assumptions, or indeed go and look for outside money. 2) should you get money from VCs or somewhere else ? There's a good analysis here by Marc, founder of Netscape. It's not definite but sheds some light into the process. I had missed this announcement: just going through some old blog posts (I hardly read any now). 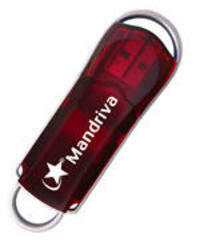 Occam Capital has invested in Mandriva. Good stuff. I know the team at Occam pretty well, and the founder of Mandriva as well. Interesting mix. And I remember discussing the possibility of this deal a very long while ago on the phone... The challenge is huge, but there are a few possible strategies to make Mandriva standout vs. Ubuntu (the main challenger) to the 2 US-based firms: Redhat and Suse / Novell. Not to forget of course the development of Redflag and other minor distributions. Any other thougths are welcome: I've stopped using Fedora and Mandriva, and have moved on to Ubuntu for its simplicity, but it's mainly a B2C proposition. Update: Codor has more and Didier has mentionned it too. are you going to Innovate this year ? I personally had a great time in the past 2 years at the European version of DEMO: Innovate! Europe. I was lucky (!) to open up the second day last year with the 9am speech (find it here) after a very very long night of hanging out with the entrepreneur & VC community. All of the presentations from last year are online, thanks to vpod.tv :) on Chris' site. You will just need to register for free once. Good practive for the folks this year. Check my pix on Flickr from the last 2 years as well and the RSS feed for my videos from then as well. I hear Charles Liebert, Charles Nouÿrit, Alexander Casassovici are going. who else ? So no news on Benchmark's site yet, but a post entry on Zubka's blog. This site is surfing on a new wave of HR recruitment: companies post an offer and propose a bounty to anyone who finds a suitable candidate. Hence bounty-hunters start tapping in their friends addressbook, looking for the right person, hoping for a quick buck. Benchmark is by no means the smallest investor around, with a few billion dollars under management. Interesting investment. We have our own JobMeeters in France that has been promoting the same concept for the past 18 months... Here's my interview of the co-founders in October 2005, and them presenting later in March 2006. I'm here at the LIFT Conference where this new Wifi company, Whisher, is a sponsor. 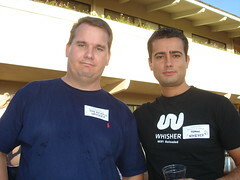 I met these spanish founder folks at the Techrunch party 7 in Menlo Park last summer. They're also well known engineers from Swisscom that my partner Ivan used to work with. I haven't tested the service yet, although it looks like a nice alternative to FON ? They just got funded by a major VC firm. I'm not sure it's public yet so I'll let them release the PR. Updated below: This is based on the $470.01 closing share price of Google on Wednesday. Google did an SEC filing today which detailed the shares split between the three YouTube founder and investor Sequoia, among others, for the total $1.65 billion acquisition deal, reports WSJ. -- Chad Hurley received 694,087 Google shares and another 41,232 shares in a trust. Based on Google’ market price of $470.01, that values Hurley’s stake at $345.6 million. -- Co-founder Steve Chen received 625,366 Google shares and another 68,721 in a trust, indicating his stake is valued at $326.2 million. -- Jawed Karim, the third co-founder, received 137,443 Google shares, with an indicated value of $64.6 million. -- Sequoia Capital’s holdings include 941,027 Google shares as part of its Sequoia Capital XI fund, with an indicated current value of more than $442.3 million. -- In total, Google registered about 3.23 million Class A shares to issue to former YouTube stockholders in connection with the acquisition of the video site, according to the filing. Buddy Felix Petersen has just raised $3.5m (2.7m€) from Doughty Hanson. He had told me at DLD a couple of weeks ago, but the press release came out yesterday. 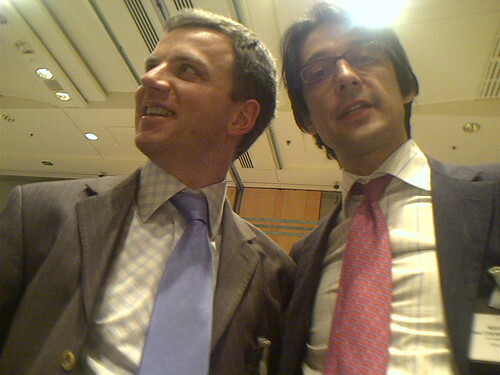 Florent & Jean (navx.com), originally uploaded by rsepulveda. All info on NavX coming on their site. The investor is Innoven Partenaires. They are positionning themselves in the rapidly evolving GPS market, and on board devices in cars.